Ear: loopy and long ears. 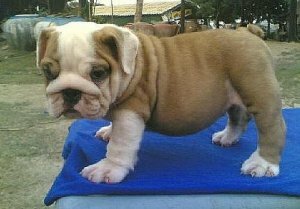 We have English Bull Dog puppies which comes from champion bloodline are available at clawsnpawskennel.We have both male and female puppies available.These are affectionate, uncomplicated, gentle, intelligent, sensitive, and fearless .English Bulldogs have short legs and tails, rounded chests.We can take care of delivery for all over India. No transportation charges.